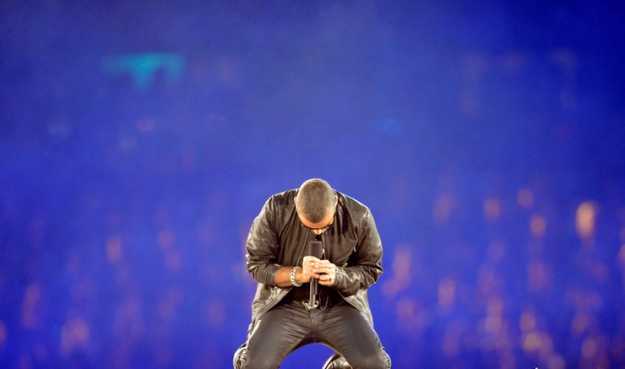 British singer George Michael performs during the closing ceremony of the 2012 London Olympic Games at the Olympic stadium in London on August 12, 2012. Rio de Janeiro will host the 2016 Olympic Games. Throughout his four-decade career, British pop star George Michael gave some incredible performances, but perhaps none more legendary than his impassioned renditions of one of the most famous rock songs ever. Queen & Michael's "Somebody to Love" performance was one of Michael's best performances of his life, partially because of the circumstances surrounding it, and partially because of the lifetime of philanthropy that followed it. The concert where Michael performed with Queen, in memory of legendary Queen frontman Freddie Mercury, was one of the most memorable times Michael used his music for philanthropic good. Mercury died of complications due to AIDS in 1991, and the concert was one of the biggest and most public support movements for AIDS victims in history at the time. To this day, Michael's cover of Mercury's part is widely considered one of his best performances of all time. Coincidentally, Michael performed in the concert just after he found out that his partner at the time, Anselmo Felleppa, a Brazilian dress designer, was dying of AIDS. “He was the first person I had ever loved, and I discovered he loved me too,” Michael said of Felleppa in a 2009 interview. The love and pain that Michael was feeling is almost tangible in this performance, and they led to charity work that Michael would be dedicated to for the rest of his life. Since those two powerful experiences, Michael had been a dedicated advocate in the global fight against AIDS. One of his most famous songs, "Jesus to a Child," was written for Felleppa, and Michael dedicated the song to his partner every time he performed it publicly. He was a long-time patron of the Elton John AIDS Foundation, working with his close friend to provide millions with AIDS treatments and end the stigma around the disease. He also continued to specifically incorporate his passion for music into his activism — he frequently recorded songs to benefit charities and his last world tour Symphonica included a show where all proceeds were donated to John's foundation, including the black tie dinner afterwards. His philanthropy informed his music and vice versa, to the betterment of both. The "Somebody to Love" performance is one and always will be one of Michael's most enduring, which is particularly meaningful in his long and storied career. It was also the beginning of Michael's other career, a life in professional activism that benefited potentially millions of people over the years. Michael's "Somebody to Love" rendition is a tribute to his lifetime of activism, which should be remembered and appreciated just as much as his music.